Translation is becoming a utility, like electricity, water and internet. That is a vision come true, according to TAUS, the Translation Automation User Society. Soon translation will be embedded in everything we do, on every screen in every app. Content will be available in any language at any time. It will not be perfect, but in most cases real-time communication is considered more important than linguistic excellence. Jaap van der Meer, founder and director of TAUS, talks about this topic and discusses with Scott Abel the challenges and opportunities for every content publishing company and every professional service supplier in this new environment of ubiquitously available translation. 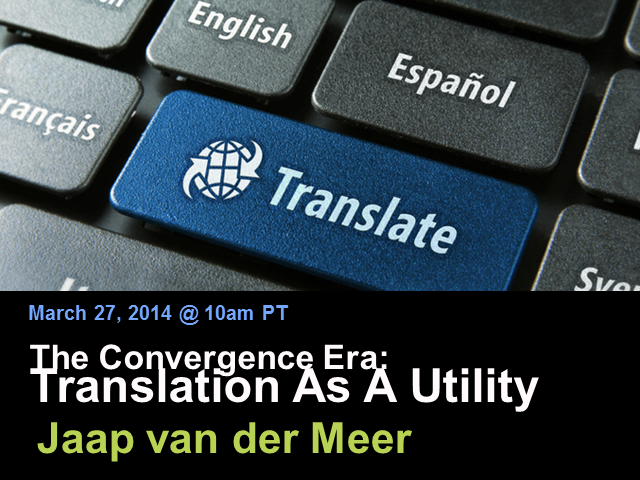 They will zoom in on what TAUS calls the “Convergence Era” in the evolution of the translation industry. It is time for every company to adopt an enterprise-wide language strategy. Jaap and Scott will discuss the eight things to change that TAUS has identified as the key components of an enterprise-wide language strategy. Shifting to a dynamic approach to quality evaluation from the current one translation quality fits all purposes and content is one of the eight things. Join this webinar to get a full picture of translation in the 21st century.